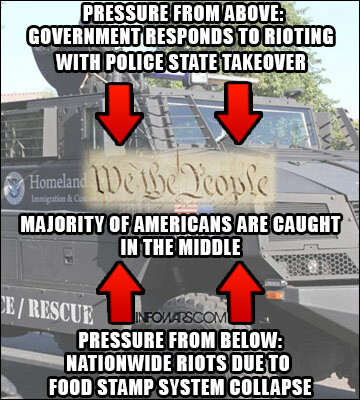 By encouraging mass dependency on the welfare state, the Obama administration is ensuring that nationwide rioting due to a large-scale collapse of the food stamp program will “justify” an explosive expansion of the police state. Under pressure from above and pressure from below, the American people will be in serious danger of losing their rights and what remains of the republic. Now that over 47.7 million Americans, nearly 1/6th of the U.S. population, are dependent on food assistance and that the United States Department of Agriculture, which oversees SNAP, ordered states to withhold electronic transfers of benefits for the month of November until further notice, the rise of the police state under the guise of riot response may very well come into fruition.